Ohio Scientific, based in Ohio, USA, were the makers of the Superboard II. 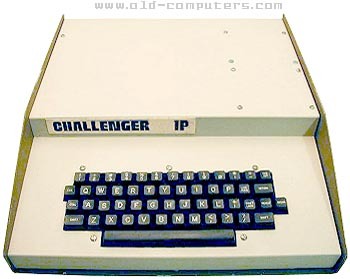 The Challenger 1P and Challenger IIP-MF were essentially cased versions of this single board system with integrated keyboard, a single 5Volt power supply and the first 6502 version of Microsoft BASIC interpreter. An optional floppy disk controller and a extra 24K of ram for this unit was available using a 610 expansion board. The C1P-MF was an upgraded version of the C1P having 20 KB of RAM and one 90 KB floppy disc drive. Memory could be upgraded up to 32 KB. The Superboard and its derivatives had good user support and many programs were available. It had basic keyclick sound capability that could be added by popultaing components (resitors and caps) on the main board.An RS-232 interface could also be added this way and there was a cut-out on the back to mount a DB-25 connector for it. Video output was composite and required an RF modulator to display output on a regular TV. I had a MicroVerter box that put the output on ch. 13 or 14. The text mode was really 32 x 32, but because of TV overscan only 24 x 24 was used. As was common, I soldered Atari joysticks to the numeric keys to allow gaming (there was a standard for this mod). see more OHIO Scientific Challenger 1P Ebay auctions !